Zoas, rock nems, macroalgae.. 3 of my favorite reef things! Mushroom garden. Lost my green ric for unknown reasons, gotta find another one But I did hack my orangey/blue one into about 5 pieces cause it was getting too big. You can see two of the pieces here, and they're already growing new mouths! Crazy stuff. Also grabbed some Emeralds from another vendor but they haven't fully opened yet so took some pics of the other zoas that have been growing out. Thanks for looking, I'll try to get some more pics later. Love the new zoas !! Tank is looking awesome,as usual. Welp, it's been awhile Been busy with summer classes but I'm home for a couple weeks before the fall quarter starts so I'll be paying some actual attention to the tank until I leave again. Unfortunately, something's been wiping out my zoas and I'm not sure what. It's pretty frustrating since the same thing has happened before. Basically the zoas will stop opening, shrink, and eventually melt away. The encrusting mat that connects the polyps turns into really thin strings and before I know it, the entire colony is gone. This has happened in my 3 gallon and it's happening now. I've already lost the king midas (20+ polyps) rainbow hornets (10+) and the zoas I picked up from LARS. The lazer lemons and red hornets don't look too good either. I've also been battling flatworms and bryopsis for the past couple of days. Also saw some zoa eating nudis awhile back but I plucked them all out and haven't seen them since, though if I had to guess what's been taking out the zoas, those and fungus would top my list. It's disheartening to witness some of my favorite morphs melt and it's really a guessing game which is going to be next. If whatever is causing this spreads to the rest of the collection, I'm not really sure what countermeasures to take. This, the other pests, and the fact that I'll be away from the tank again soon puts me in a pretty bad situation, and I don't think my parents will be up for any complicated treatments. What happened to the tank? It's supposed to have water and rock and corals and stuff in it! Literally. Santa Barbaras got a wildfire going on, finals are postponed and I'm home a week early! It's been awhile though. I gave up the bryopsis fight and it's been tough getting myself motivated- tank was too ugly all the coral and inhabitants I could find have been relocated while this one dries out. Not sure how long bryopsis spores last... planning to rewash the tank after a week and see where to go from there. Stay safe over there,these fires are out of control. Ah bummer, I get it though. Looking forward to seeing something new up soon! These fires are wreaking havoc. Thanks! I think I'll be keeping it simple as usual. Macros, zoas, easy stuff. So basically the same as before lol. I do want to try a deeper sand bed relative to the tanks depth ~1.5 in of sand for a depth of about 6 in. Any thoughts? Well. It took longer than I thought, but I managed to get most of the stuff I wanted to get the tank back up and running. I'm currently working for an aquarium servicing company and get pretty good deals on hardware and dry goods so I'm just slapping things on, seeing how they do, and cutting back if it's too much (MP10 might already be a bit overkill). 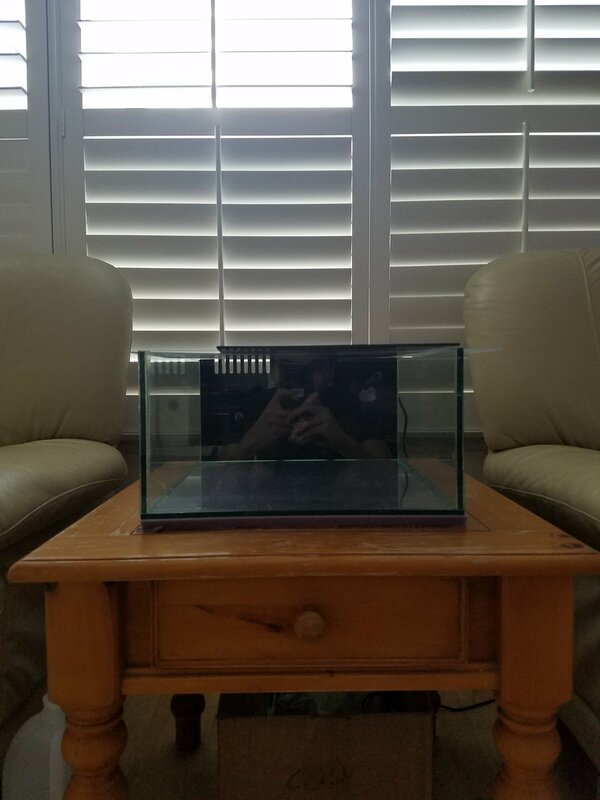 Goal for this tank's second run is to get some SPS going :) To do that I'm trying out a QQ1 skimmer that I took out of the filter shell and just added to the back chamber that it luckily fits into. Hopefully it starts to pull some skim but it's hard to adjust the water level at the moment. Still need to pick up a carbon and GFO media bag as well. Will also experiment with dosing but that's for later. But for right now, some pictures of what I've got! Currently on its 3rd day of cycling (lol) with Dr. Tim's one and only. Ammonia at 0.50, NO3 at 5 ppm so chugging along. Hoping for no ammonia by end of the week but we'll see. Stay tuned! Great to see this up and cycling @antsypants! An SPS dominant reef will be so cool in this tank! Yay! Finally starting to get splotches of diatoms :) hard to tell from the pic but they're there. Hopefully this means my cycle is nearing completion after 2 weeks. I'll check my levels tomorrow to get a better idea of what it's like in there. If my ammonia drops and stays at zero by the end of this week I think I'll pick up a small CUC to start things off. I also want some micro brittle stars again but that can wait as I don't exactly have a source of those. Woo hoo! Back in action! Looking forward to watching this tank grow! thanks! It feels like I've missed so much but seeing tanks like yours still running it's like I never really left 😊the 17 g looks amazing btw!